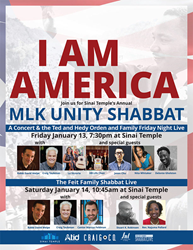 The 11th Annual MLK Unity Shabbat will be held at Sinai Temple on Friday, January 13 at 7:30 p.m. and Saturday, January 14 at 10:45 a.m. Services will be held over two days, and honor the legacy of Martin Luther King, Jr. The evening begins with The Ted and Hedy Orden and Family Friday Night Live service led by Craig Taubman and Rabbi David Wolpe. The evening will include dozens of faith leaders from throughout Southern California including Rev. Najuma Pollard, Delonte Gholston and Nancy Frausto. They will be joined by musical artists Nita Whitaker, the HB Barnum Life Choir, and spoken word artist Jason Chu. The service and concert now in its 11 year is made possible by the generosity of Judy and Tom Flesh. "In a time marked by division we stand, pray and represent unity among the different races and religions of our great nation,” said David Wolpe Rabbi of Sinai Temple. The celebration continues the following morning at 10:45 with special guest, Najuma Pollard, who stated: "We cannot achieve justice when or if, the cause is fueled by a 'Just-Us' mindset. It will take a great cloud of witnesses, of all faiths, to realize freedom and justice for all." Rev. Dr Najuma Smith-Pollard, is the founding Pastor of Word of Encouragement Church, one of 5 faith communities that meets at Taubman's budding interfaith and cultural center, the Pico Union Project. Services will also feature songs by the Vista Del Mar Choir together with entertainer and community leader, Stuart K. Robinson.